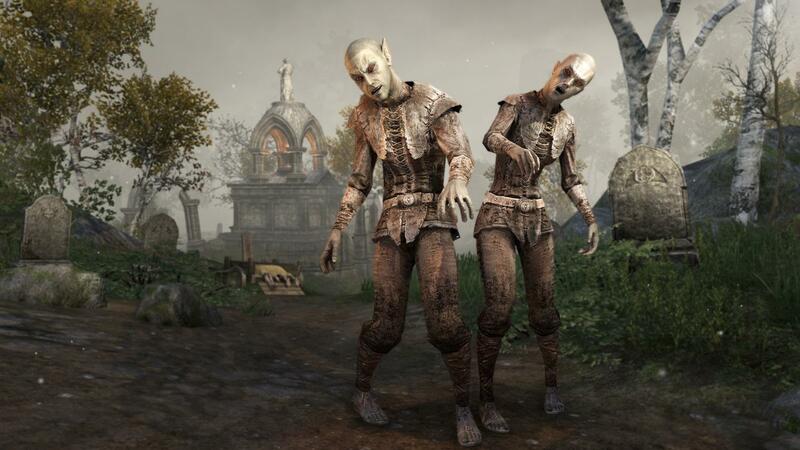 On October, the Crown Store reveals many new exotic costumes and masks, mysterious mounts to celebrate the Witches Festival. Check out some of last year's most popular Witches Festival items and other all-new rare and mysterious collectibles below. Crown Crafting Motif: Grim Harlequin - Do you like dark humor, grim but funny? We've got a stylish motif for you! The Grim Harlequin Crown Crafting Motif will be available on all platforms from October 9 to October 13. Exorcised Coven Cottage - House hunting? 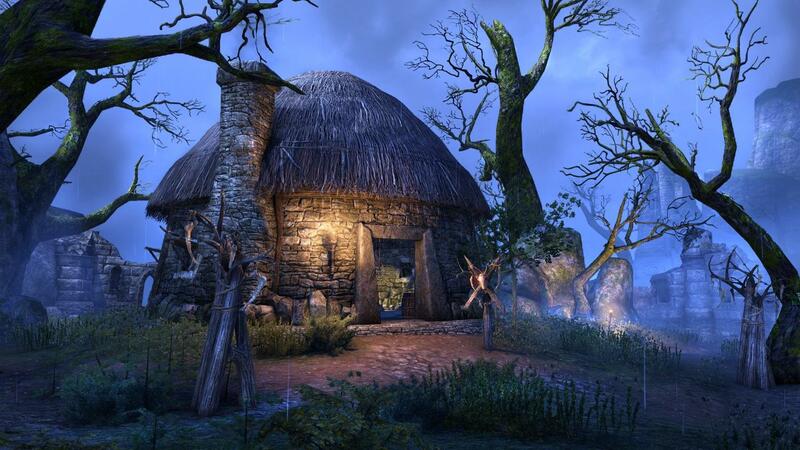 It's a rumor that this witches hut on the edge of Hag Fen in Glenumbra is guaranteed NOT to be haunted by the dead, the undead, or restless spirits of any kind. It does come with tumbledown walls to keep the crocodiles and wolves out. Spooky, yet cozy! The Exorcised Coven Cottage will be available on all platforms for a limited time, from October 19 to November 1. Shadowghost Horse - They are never bred, only found, and then only on misty nights when both moons are dark. Then they are summoned from beyond by hooded Shadowghost Wranglers, roped and saddled and broken for riding by ordinary mortals. 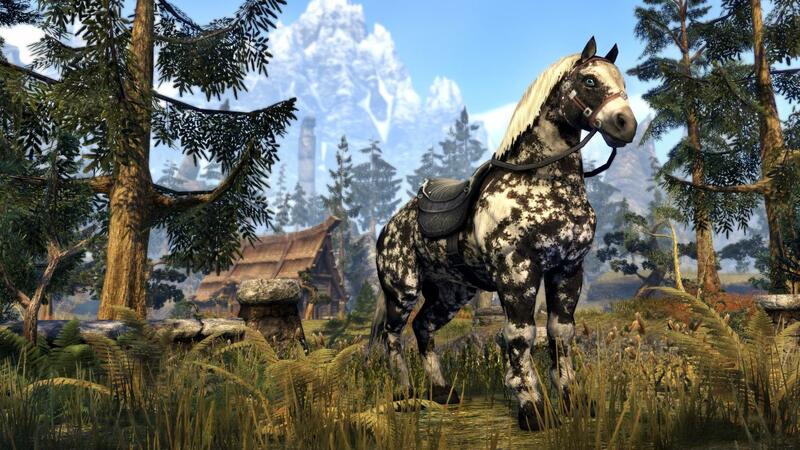 The Shadowghost Horse will be available on all platforms for a limited time, from October 5 to October 9. Shadowghost Guar - Blending in with the shifting gray ash clouds on the slopes of Red Mountain, the Shadowghost Guar are the only known nocturnal breed of the species, and thus are rarely seen, even by the native Dark Elves. This makes them one of the most distinctive and desirable mounts in Morrowind and beyond. 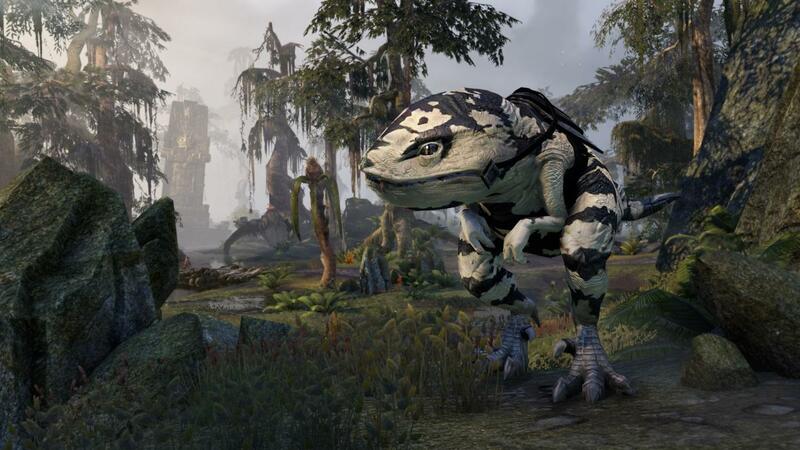 The Shadowghost Guar will be available on all platforms for a limited time, from October 12 to October 16. 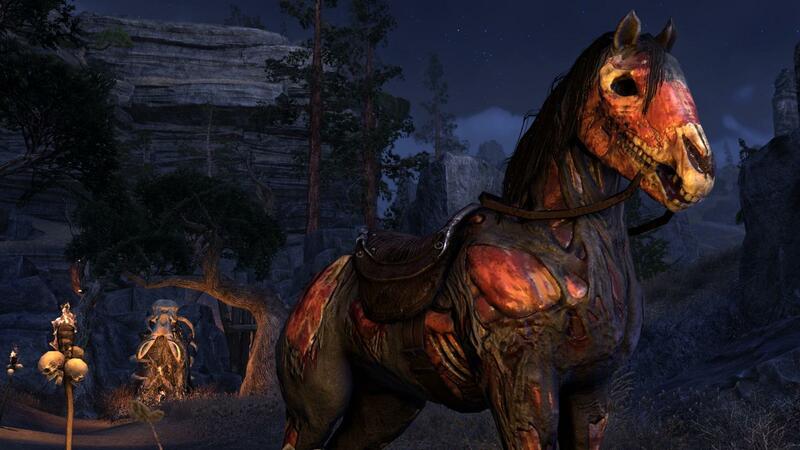 Zombie Horse - Mannimarco's Order of the Black Worm must be responsible for the re-animated Zombie Horse, as it was first seen in Cyrodiil as a Worm Anchorite's mount. But what else would you ride when dressed as a Scarecrow Spectre? The Zombie Horse will be available on all platforms for a limited time, from October 16 to October 20. Shadowghost Wolf - Unlike nearly all other wolves, the Shadowghost Wolf has no pack and lives a solitary life, haunting lonely moors and wastelands, appearing only at night and rarely then. Some doubt it is a real creature of the mortal plane at all. 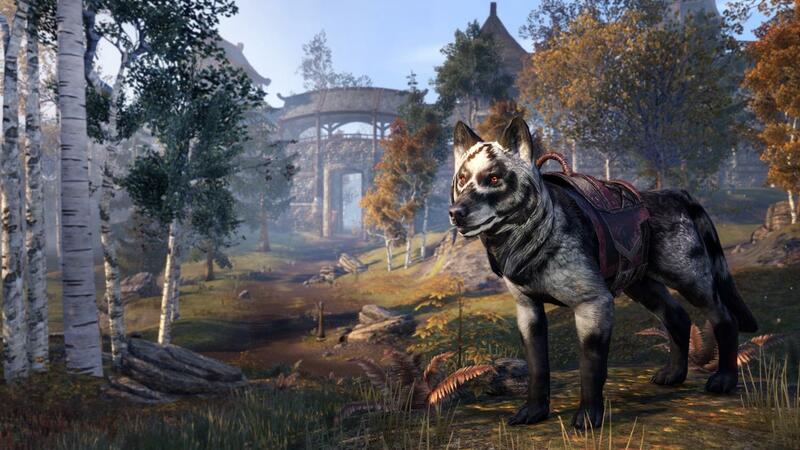 The Shadowghost Wolf will be available on all platforms for a limited time, from October 19 to October 23. 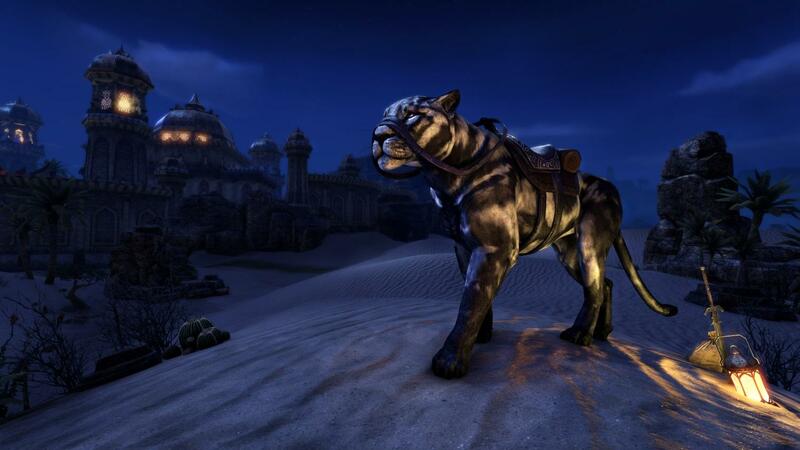 Shadowghost Senche - An oversized breed of black senche-panthers, the Shadowghost Senche is said by the Khajiit to be sacred or rather unholy to Namiira the Great Darkness, who sends them as mounts to bear away those who are doomed to die. Dare you ride one of these dark cats in the dead of night? The Shadowghost Senche will be available on all platforms for a limited time, from October 26 to October 30. Zombie Personality - It will be available on all platforms for a limited time, from October 23 to October 27. Shadowghost Pony - Are they real pets, or the stuff of dreams? It's said that to catch a Shadowghost Pony, one should seek out a cemetery on a dark night during Witches Festival and wait quietly near the grave of a child. Bring a carrot or sweet apple. 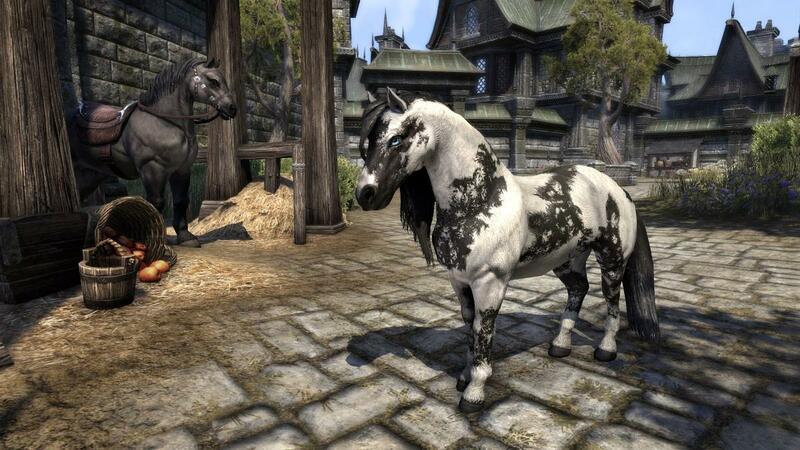 The Shadowghost Pony will be available on all platforms for a limited time, from October 5 to October 9. Jackdaw Daedrat - The planes of Oblivion are infinite in their variation—and so are their vermin. 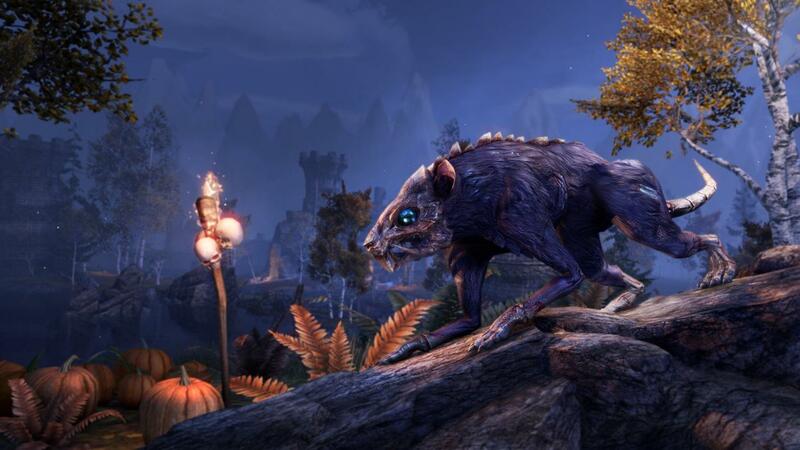 The Jackdaw Daedrat is a bony Daedric rodent that likes to collect shiny things like your jewelry, and nip and nibble at things it shouldn't. But at least it's cute, right? The Jackdaw Daedrat will be available on all platforms for a limited time, from October 12 to November 1. Werewolf Lord Polymorph - Don the Werewolf Lord polymorph, and show them who's the big dog! 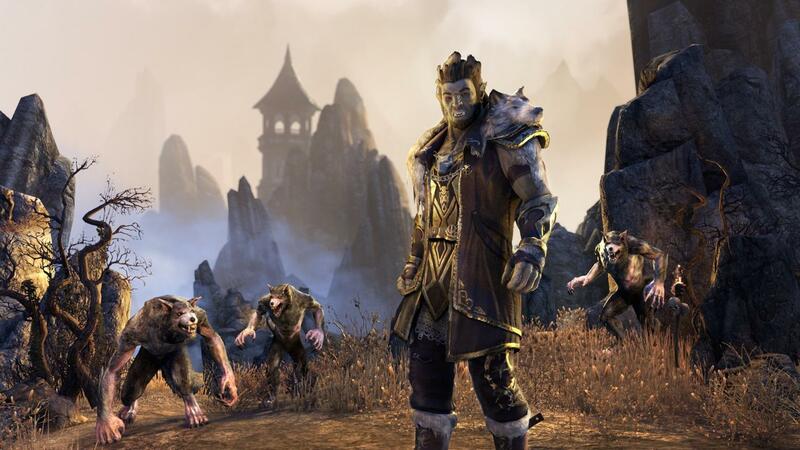 Wear Hircine's Gift with pride as the savage leader of the lycanthrope pack. Time to howl! The Werewolf Lord Polymorph will be available on all platforms for a limited time, from October 2 to October 6. Pumpkin Spectre - Shor's bones! 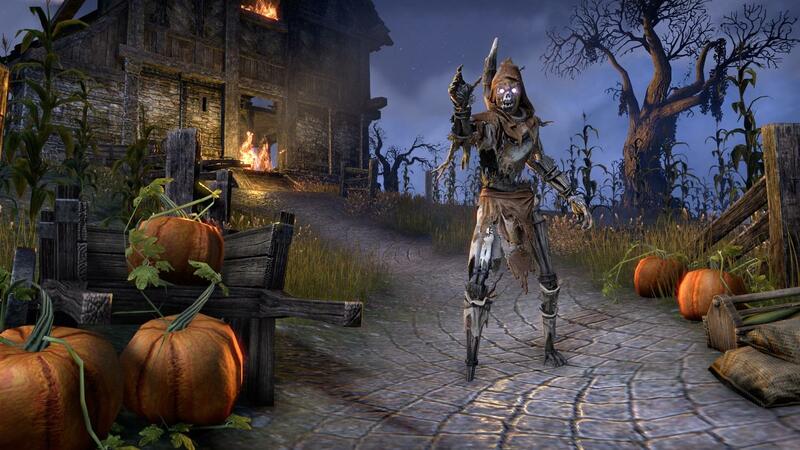 A Pumpkin Spectre is like a horrific figure from a skooma-induced nightmare! And with this costume, the wearer can take on the chilling semblance of these dread monsters. The Pumpkin Spectre polymorph will be available on all platforms for a limited time, from October 23 to October 27. Scarecrow Spectre - The dark magic that makes a spectre animate a scarecrow is thought to be related to those spells that create lurchers from spriggans. Wherever they come from, this costume enables the wearer to assume the guise of one of these Scarecrow Spectres. The Scarecrow Spectre polymorph will be available on all platforms for a limited time, from October 23 to October 27. 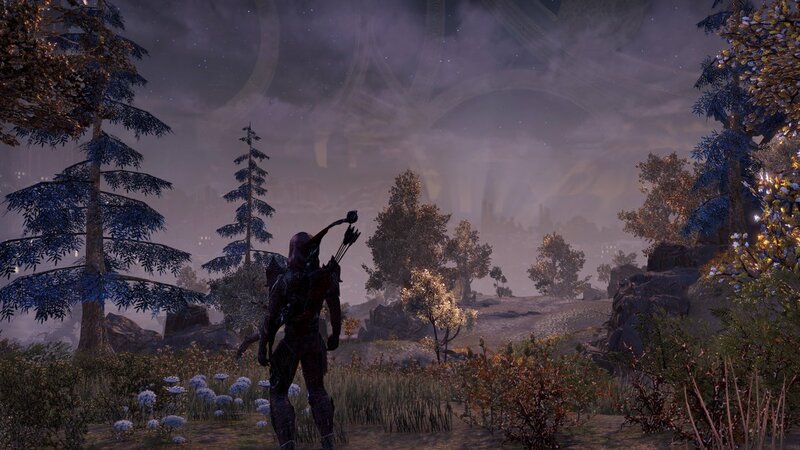 Deep Elf Executioner's Hood - Ancient engravings tell us that a Dwarven executioner, or "Chun Abakch," always concealed his or her features under a hood of black spidersilk, a material that was also used by the Dwemer for funeral shrouds. Feeling sinister? This could be your look! 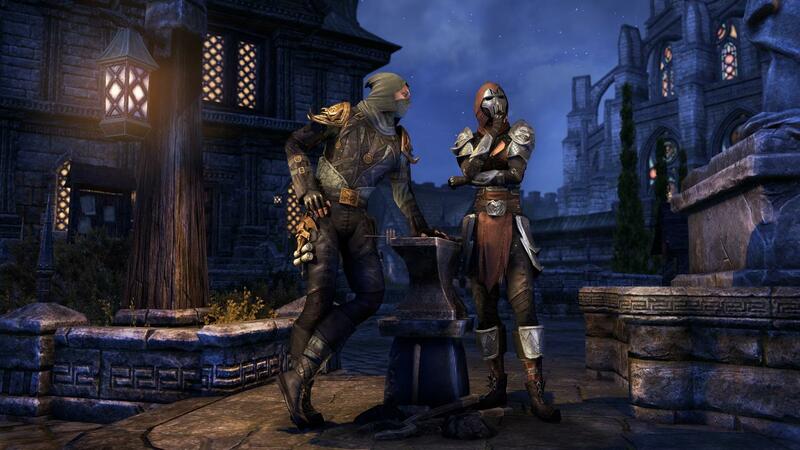 The Deep Elf Executioner's Hood will be available on all platforms for a limited time, from October 12 to November 1. Moonshadow Wings Mask - The Lepidopterans are a sect of Azura cultists who conceal their features with elaborate butterfly masks. These have recently become a fad among the jaded youth of mainland Morrowind and now you can wear one, too! The Moonshadow Wings Mask will be available on all platforms for a limited time, from October 12 to November 1. 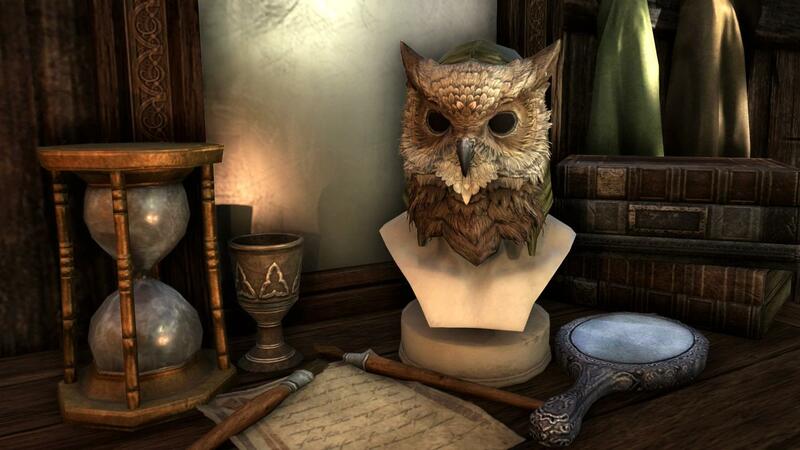 Jhunal's Owl Mask - Wise-Wing the Owl is associated in northern Tamriel with the god Jhunal or Julianos. During the Witches Festival she is said to warn the unwary away from graveyards and witches' covens. Her owl mask is sure to inspire others to trust in your wisdom! It's a real hoot. 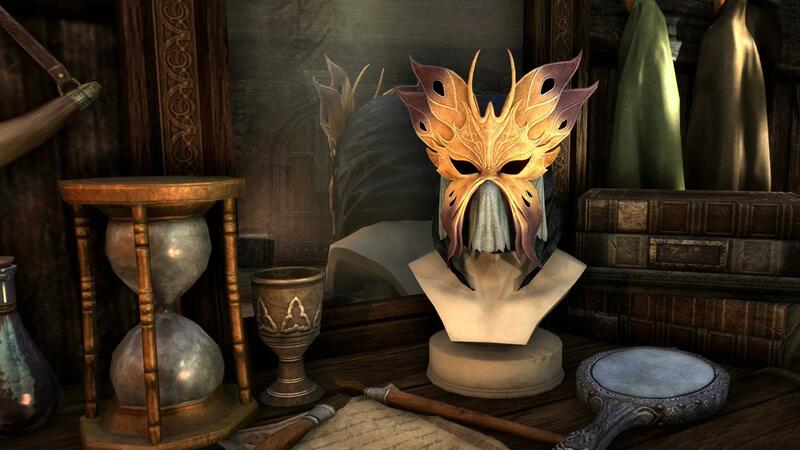 The Jhunal's Owl Mask will be available on all platforms for a limited time, from October 16 to October 20. Rajhin's Cat Mask - Feeling feline? Get cat-faced! During the Witches Festival, no one perpetrates more cunning and devious tricks than Rajhin the Footpad, the Purring Liar. This mask enables you to adopt one of the many faces of that consummate trickster. The Rajhin's Cat Mask will be available on all platforms for a limited time, from October 16 to October 20. Dibella's Doll Mask Pack - When worshipers of Dibella wish to honor the Lady of Love by engaging in anonymous bestowal of affection, they don an exquisite porcelain Dibella's Doll Mask. 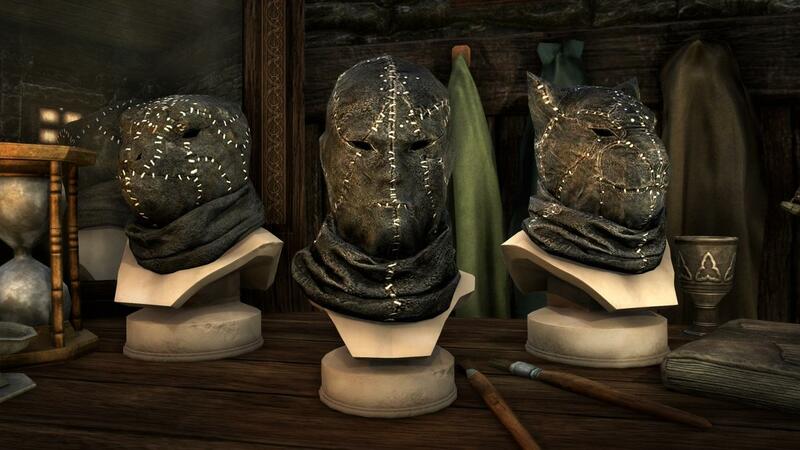 This bundle includes the Dibella's Doll Mask for Humans and Elves as well as two variations, for Khajiiti and Argonians. 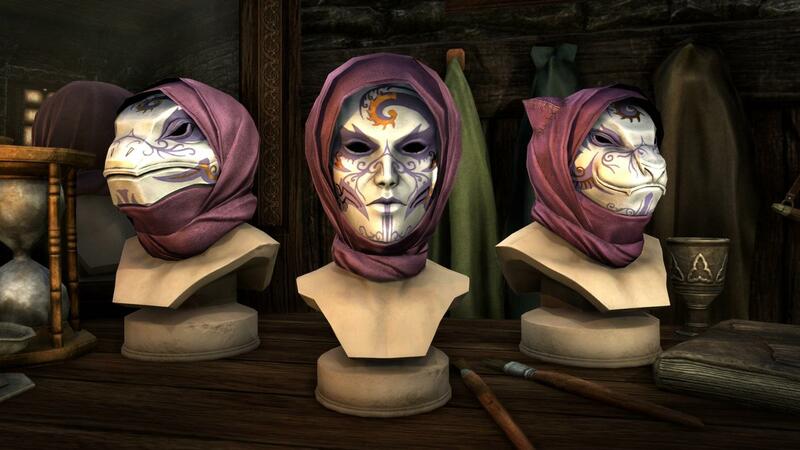 The Dibella's Doll Mask Pack will be available on all platforms for a limited time, from October 19 to November 1. Nightmare Demon Mask Pack - Incarnate the anger of Oblivion itself with this visage of nightmare terror evoking the dreaded Dremora at their most frightening. 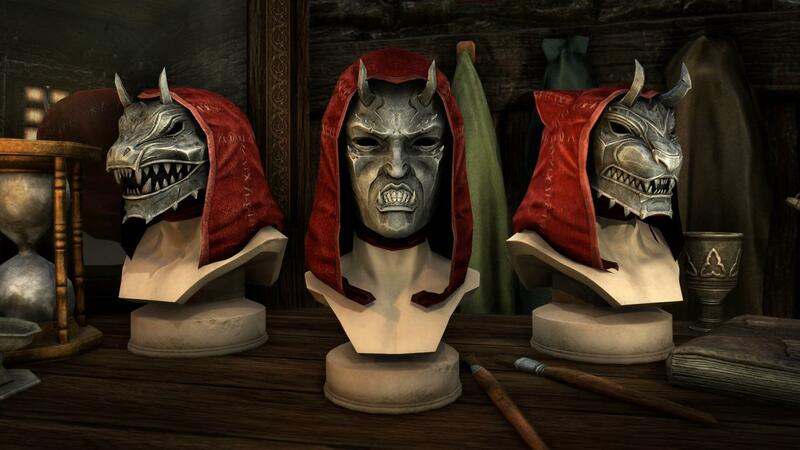 This bundle includes the Nightmare Daemon Mask for Humans and Elves along with the variations for Khajiiti and Argonians. Daemonic! 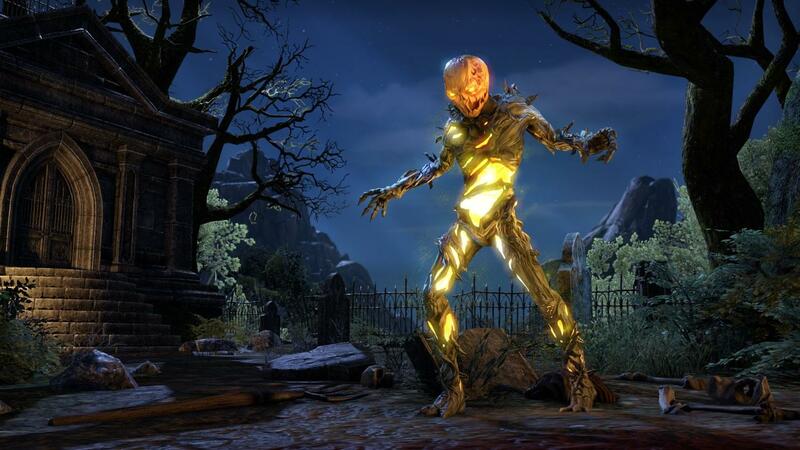 The Nightmare Demon Mask Pack will be available on all platforms for a limited time, from October 19 to November 1.